Lets start by saying that I had been researching extensively for my first fuzz-box, mainly inspired by David Gilmour tones and (on a different side of the tonal spectrum) from modern hard-rock bands (like Monster Magnet). And reading up on the net, I was also advised that perhaps a Muff-type-of-pedal could not be the ideal for me, and perhaps I should consider a different distortion pedal. So, the description of Davids pedal (fuzz / distortion) seemed to be the perfect place to start. I kept my expectations low and DID NOT think that the W.R. would be the exact / perfect pedal to get the tones I was after. How wrong I was!!! 1. Volume: self-explanatory. Lets just say that it has enough volume available to blow the roof-top of your house. At 9 oclock, it had already passed unity gain with the amp. 2. Gain: from gritty blues all the way to modern, full out distortion. Totally usable in all the range. 3. Tone: Another very pleasant surprise, extremely useful through the whole range, helps you match the pedal to your rig, without ever getting piercing or muddy. 4. And last but not least: the Sag knob: it controls the voltage that the circuit operates in. Much of this pedals magic happens here: at full-on position, you maximise the headroom of the pedal, minimising its fuzz aspect and you bring it closer to articulate distortion. Back it off, and you introduce more gritt to the sound. This feature is one of those that set the pedal apart from its competition. ARGHH! BLINDING red Led! Not to complain at all, I happen to absolutely love big, blinding leds! So, if youre twisted as I am, then youre gonna love it! The sound? Clear, articulate, loud gain, bordering OD / distortion (and not so much fuzz), perfect for a gritty blues/rock sound that is pretty familiar to us. Touch sensitive with lots of dynamics as well. I was so happy with the tones I was getting, that I spent the next half hour without even touching the knobs on the pedal, simply squeezing out as many tones as possible from the controls on my Fat-Strat (with an MHD pickup on the bridge).Having a pedal that sounds so good from the get-go, that you dont have to constantly mess with the knobs to make it sound good, is what I call inspiring and well-designed. Rolling the gain on, at 12 oclock, the tones are hard-rocking, always maintaining the clarity, making power-chords sound full and balanced and solos to jump out, on all pickups. In order to keep the 2 GFS Neovins (in the neck & middle position) from getting too dark (not the pedals fault, they just tend to do so), I roll the Tone knob to 9 oclock and when I play in the bridge position, I use the guitars tone control. Everything sounds perfect and, equally importantly, it works as it should on the pedal. The pedal was only limited by me, not by its controls. Amazing! Just so that you can get a better idea: the amp used was a Blackstar HT-1R. Incredible stuff! I cant wait for the next offerings from David. The man has a great pair of ears, for sure! Nice review, Hector ! I wanted one of these pedals from his development vids - now I REALLY want one. Thanks a lot man, I don't think you will be disappointed at all! Thanks for taking the time to write this up! Nothing makes me happier than someone else enjoying my pedals! Now I really need to stop playing and get onto the next build! For my next build I'm torn. I don't have a compressor yet so was planning on trying my hand at one, but I'm really loving the TS / Rhino type pedals and have been a secret admirer of the Blues Breaker pedals I've heard...also a few more schems have tickled my fancy, not to mention my love affair with a nice reverb... I need more hands and definitely more time I still have the last two White Rabbits to finish up! Nice review Hector! Dang, should have went the trade offer Cheopis made me! Sounds like a really nice pedal! Well i just put in an order for one based on your review! You diden't let me down on the TC repeater, so this ought to work out good since this seems to be exactly the pedal i was after . Gritty distortion, fuzzy and allround awsome. That leaves one White Rabbit remaining and looking for a home! Thanks man. You really can't say that, because it all boils down to what tones each player is after, who knows, perhaps a WR wouldn't / couldn't be what you're looking at the moment. For me, it was a perfect timing. All right, bud! I can tell you this: the WR and the Repeater work BEAUTIFULLY together, in more ways than one. You will have a lot of experimenting to do! It seems that I'm finding some favourite settings on the pedal. Since I was using it with the voltage knob on less-than-full-on positions, I switched to a normal 9V power supply. BTW, that makes the led less bright (still pretty bright though!). I keep it 12 o' clock, which gives some ''grit'' to the tone. Gain knob also at 12 o' clock and tone adjusted depending on guitars. This way, it gives me enough gain and a nice range of sounds to mess with, from bluesy to pretty hard-rocking (with attitude) and some ''hair''. Extremely musical and usable sounds all around. So, I can leave my Crunch Box on a JCM-800-on-full-roar kind of tone dude and the Ram's Head clone on the (as expected...) gilmour-ish setting. Great review!!!!! It sounds amazing! I'm still waiting for him to do his take on a certain green monster! You're making my fingers itch Hector . Would there be a possibility to do some sound clips maby? 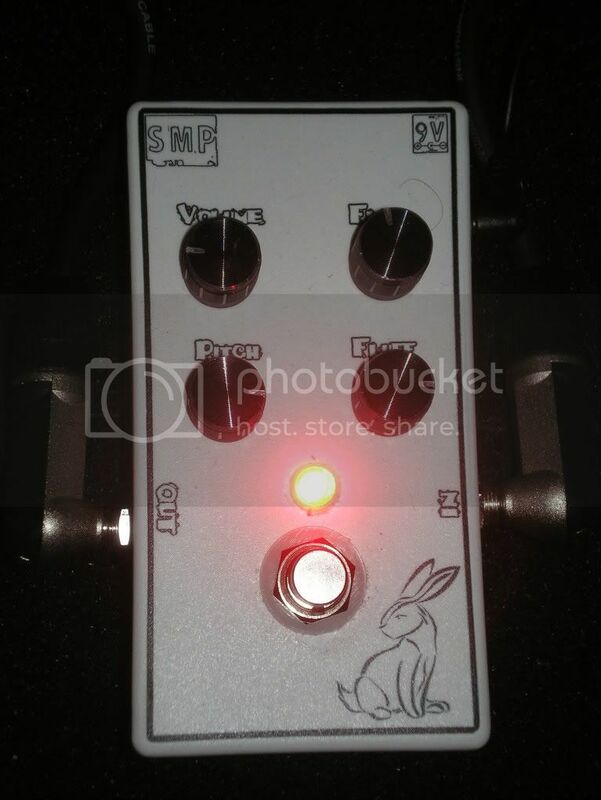 Since David is about to launch the new batch of White Rabbits (the new version comes with a toggle-switch, for more tonal options, as I have heard... ), it seems the perfect timing for me to revive this all thread. 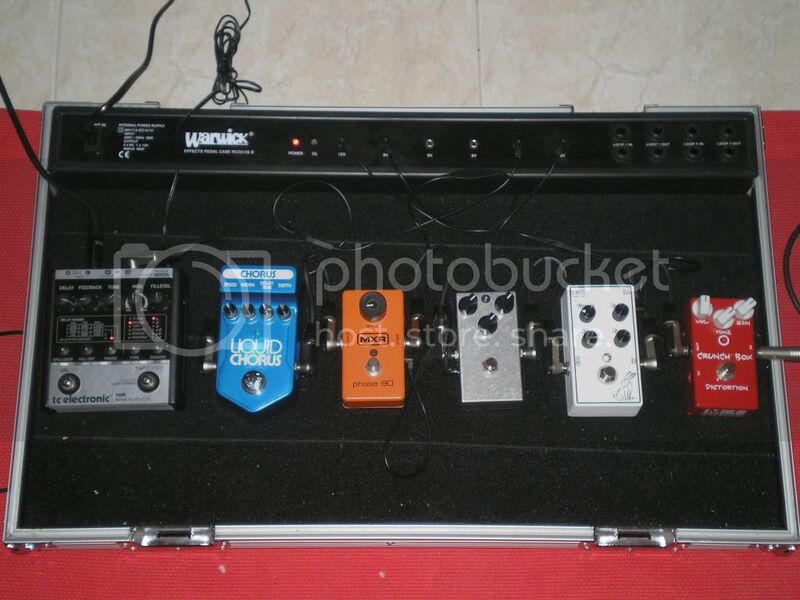 I had minimised by board to 3 pedals all an all and the White Rabbit was one of the 3 that stayed. This speaks for itself. It has proven to be my perfect rhythm pedal, even though it can do some very syrup-y leads as well. Changing the pickups & electronics in the LP has helped me a lot getting even more tones from the WR. I can add brightness from the Tone control ,for example and use the guitar's tone knobs to dial it out if / when I feel like it. Same with the Gain knob, I have maxed it out and control the dirt from the guitar's volume knob ('50s wiring FTW!). Great pedal there folks! I have been looking around for the proper OD / boost pedal to pair it up with, to be able to drive it even harder for those moments. A keeper without a doubt. Thanks for the kind words again, I'm happy you're still liking the pedal!